WDGPH will continue to implement strategies to reduce preventable external vaccine wastage in the community. WDGPH receives weekly shipments of publicly-funded vaccine from the Ontario Government Pharmacy (OGP). WDGPH distributes this vaccine to physician’s offices, long-term care homes, hospitals, community clinics and group homes and is responsible for cold chain management and education. From January to December 2018, WDGPH distributed $7,127,738 in vaccine to community partners in Wellington, Dufferin and Guelph. WDGPH packs and distributes vaccine to all community healthcare providers except pharmacists. Pharmacists receive their vaccine directly from a Ministry designated distributor. However, WDGPH is accountable for reporting vaccine wastage incurred by pharmacies, routine vaccine fridge inspections, for ensuring cold chain protocols are adhered to and responding to cold chain incidents. Currently, pharmacists carry only publicly-funded influenza vaccine and any vaccine they purchase themselves. Vaccines require storage within a consistent temperature range of 2° and 8°C, known as maintaining “cold chain.” Cold chain begins with manufacturing, moves through government distribution channels, and ends when the vaccine is administered. A vaccine is wasted if it is exposed to temperatures outside the appropriate range or expires before use. Vaccine wastage, in Ontario, is a significant and preventable liability, affecting vaccine safety and efficacy. The Ministry of Health and Long Term Care (MOHLTC) provides the Vaccine Storage and Handling Protocol (2018) in order to achieve greater standardization in the management of provincial vaccine inventories. This protocol outlines the proper storage and handling of vaccines, quality assurance activities and provides strategies to minimize and reduce provincially-funded vaccine wastage.1 This protocol requires that Health Units have no more than 5% wastage for any individual vaccine product annually. If wastage exceeds this level, the MOHLTC specifies that additional inventory control measures shall be taken to reduce it. 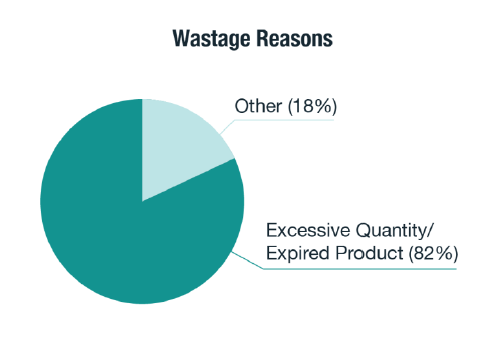 and inventory in ongoing efforts to decrease unnecessary wastage. The Panorama system allows WDGPH to monitor and track vaccine distributed to community partners with greater accuracy. In the past, the MOHLTC chose three (3) specific products (Influenza, HPV and MMR) to monitor individually for wastage and WDGPH was required to provide a rationale for wastage above 5% for these accountability indicators. In 2018, these indicators were not requested and these three (3) vaccines are included in the overall wastage reporting. The overall wastage in 2018 for all vaccines distributed by WDGPH was 4.7% and valued at $297,760.64. The greatest risk for vaccine wastage is healthcare providers ordering quantities greater than they will use prior to the vaccine expiring. It is important to note that expired vaccines are not always returned to WDGPH in the calendar year that they are distributed. Therefore, the vaccine wastage rate for some individual vaccines may be higher than the number of vaccine actually distributed during that specific year. 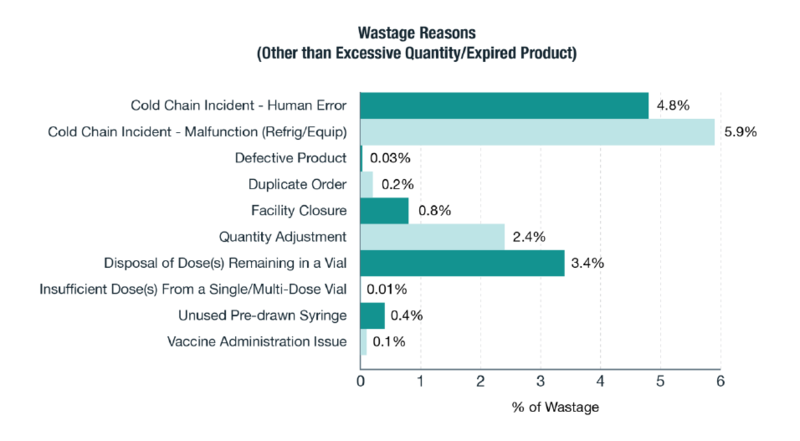 Influenza products are the most frequently wasted as they expire annually and demand for vaccine is difficult for healthcare providers to accurately estimate. WDGPH Cold Chain team responded to 42 cold chain excursions reported by community healthcare providers in 2018. Follow-up to reported excursions is a comprehensive process for WDGPH staff. This process involves assisting the healthcare provider resolve the immediate cold chain issue and follow-up with the vaccine manufacturer(s) with regard to the time and duration of exposure to assess whether the vaccine can be used or must be wasted. Education on cold chain storage and handling is provided, where required. During cold chain related investigations, other issues are often discovered, such as expired product in the facility or over supply of vaccine on hand. The vaccine management team will work with the health care providers to mitigate these identified concerns. Re-inspections and unscheduled audits are conducted in cases where re-occurring issues are attributed to human error. Expired vaccine due to over-ordering remains the most common cause for vaccine wastage in the community, rather than cold chain excursions. Vaccine distributed to healthcare providers cannot be returned for redistribution and any vaccine that cannot be used is considered to be wasted. Vaccine over-ordering by community partners is the key factor for vaccine wastage in Wellington, Dufferin and Guelph and is difficult to control without negatively affecting service to clients. For example, if vaccine is too closely rationed via inventory controls, clients may miss an opportunity to be vaccinated during a routine visit to a healthcare provider because they have no vaccine. WDGPH depends on community partners diligently monitoring their own vaccine supply and demand, and ordering accordingly. A portion of the overall annual wastage fluctuations can be attributed to community partners returning vaccine from previous year(s) rather than during the same year that the vaccine was distributed. Often times this expired vaccine is discovered and returned to WDGPH during annual cold chain inspections. WDGPH monitors vaccine orders that come in from facilities by requesting an accurate count of office inventory on the order form. Distribution is adjusted accordingly. Sometimes the inventory on hand is not accurately recorded, resulting in providers ordering more stock from WDGPH than they can use before it expires. Healthcare providers are able to order and receive vaccine weekly and special requests are accommodated whenever possible. WDGPH continuously reminds healthcare providers to order a maximum two (2) week supply of any vaccine product in order to minimize the potential for wastage. The WDGPH Cold Chain team maintains efforts to engage community partners in putting increased attention on vaccine cold chain management. In November 2018, healthcare providers were provided with the opportunity to participate in a vaccine education event. In 2019, each community healthcare provider will receive an individual report, including the value of the vaccines wasted in their facility. Annual cold chain inspections were completed for all facilities (222 fridges). Spot inspections were completed following cold chain incidents. Healthcare providers are encouraged to invest in vaccine specific fridges that hold temperatures more consistently. Vaccine orders are adjusted to control oversupply. Stickers with reminders to return expired vaccine are sent with each new order. Expired vaccine on hand is collected at the time of inspection. WDGPH collaborates with the Provincial Panorama group to develop guidelines for monitoring vaccine in the community, addressing issues such as vaccine expiry and vaccine quantity stored. In 2019, monitoring oversupply is a renewed effort. WDGPH has implemented an additional control that allows us to track when each expired product in the community was ordered and how long it was in the healthcare provider’s facility prior to return to WDGPH. This information will assist the vaccine management team with facility and product specific controls for oversupply. WDGPH maintains an effective internal process for vaccine and cold chain management. Bi-Weekly inventory counts are completed in each office and internal stock requisitions are adjusted accordingly. During these inventory counts, vaccine expiry dates are checked and those vaccines with an approaching expiry date of three (3) months or less are flagged for immediate use and redistribution. Portable cooling systems that guarantee to keep vaccine within the recommended temperature range for up to 65 hours are utilized for community clinics and mass immunization events. 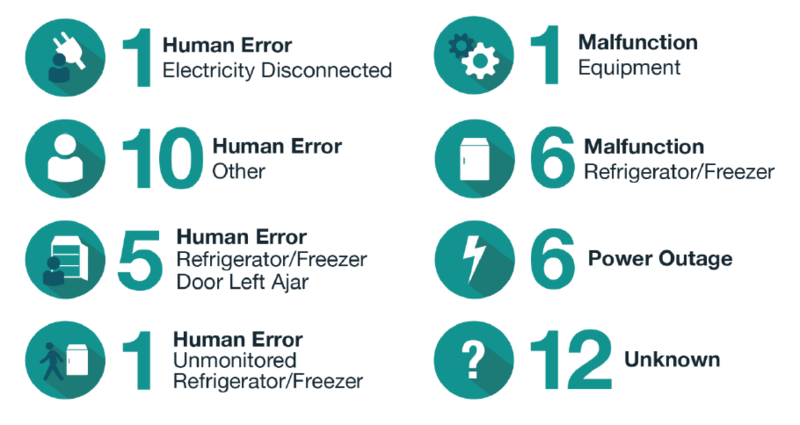 These cooling systems are available to aid in power outages, emergency responses and fridge failures. WDGPH has additional monitoring requirements for on-site vaccine fridges including a comprehensive temperature monitoring system. In 2018, WDGPH upgraded to a new system, BlueRover, which allows for a combination of internet and cellular data to provide consistent connection to the vaccine fridges. The previous Hoboware system implemented in 2015 was dependent on internet only and had in excess of 250 missed connection alarms annually. This missed connection issue was unable to be resolved. The improved BlueRover technology provides connection information in five (5) minute intervals and records data in real time, reducing staff time spent investigating missed connection alarms. When temperatures go outside the range of 3°C - 7°C an alarm is initiated and messages are sent to pre-determined WDGPH staff. This alarm range provides enough time to transfer vaccine, if needed, to another fridge and/or trouble shoot to why the temperature is too high or too low. There is a contingency plan in place 24 hours per day to manage internally housed vaccine that might be at risk. WDGPH follows all of the MOHLTC recommended processes to eliminate vaccine wastage. WDGPH continues to increase our efforts with community healthcare providers to decrease vaccine wastage that is within our control. While WDGPH has successfully implemented internal processes to protect vaccine supply, the challenge of engaging our community healthcare providers to be accountable for vaccine cold chain and inventory management is an outstanding issue. Publicly-funded vaccines are available to all community members who have a primary healthcare provider. For community members without a primary healthcare provider, vaccines can be readily accessed through any of our public health offices. Population and Public Health Division, Ministry of Health and Long-Term Care. Vaccine Storage and Handling Protocol 2018.